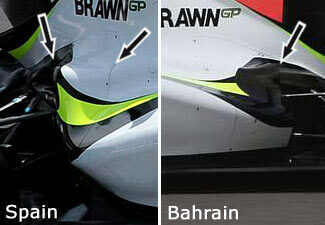 Brawn have introduced their first car updates at the Spanish GP, keeping them ahead of the competition. One of the changes includes a redesigned engine cover. While the previous design was a smooth cover, the new updated sidepods have a sharper inward curve. More in the centre of the car, following the exhausts is a new cover of the suspension components. Marked with a second arrow is also the slightly modified bodywork ahead of the exhaust openings, somehow resembling the curved sidepods of the Force India VJM02.